A study conducted by investigators from the Dental School at University of São Paulo evaluated patients submitted to surgically assisted rapid maxillary expansion (SARME) and observed that the procedure — which reduces the resistance of sutures and corrects the posterior crossbite in adults — may cause changes in the periodontal tissue (ALTUG ATAC; KARASU HÁ; AYTAC, 2006; LAGRAVÈRE; MAJOR; FLORES-MIR, 2006; SIQUEIRA, et al., 2015). The results were published in issue volume 23, number 1 of the Dental Press Journal of Orthodontics (DPJO), entitled “Periodontal clinical evaluation before and after surgically assisted rapid maxillary expansion”. Before onset of orthodontic treatment, the 17 participants of the study were submitted to periodontal control and informed on the effective control of dental plaque and oral hygiene. A Biederman expander with 13-mm Hyrax screw was fabricated and cemented on the first premolars and first molars, one week before surgery. Figure 1. 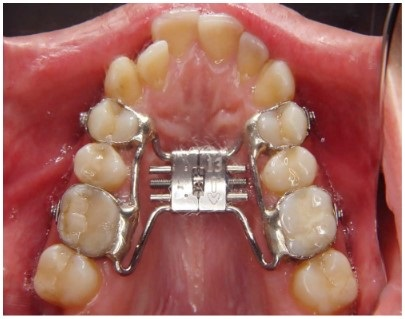 Intraoral occlusal view demonstrating the cemented expander. For periodontal evaluation, the investigators analyzed the following parameters on the maxillary incisors, first premolars and first molars: clinical attachment level, gingival recession, bleeding level, quantity of attached gingiva, at three different periods: initial, at five days and six months after surgery. The authors observed significant increase in the clinical attachment level, gingival recession and bleeding between the evaluations. Concerning the quantity of attached gingiva, the authors observed reduction between the study periods. According to the investigators, the study provides responses to a very frequent question among orthodontists and maxillofacial surgeons, on the periodontal complications caused by the surgical technique performed by subtotal Le Fort I osteotomy, with separation of the maxillary tuberosity on the pterygoid plateau and osteotomy at the anterior maxillary region. “The periodontal health in the long term is related with the buccal inclination of anchorage teeth of the expander, and to the periodontal condition of teeth after treatment”, they explain in the text. During SARME, if the resistance to opening of the midpalatal suture is very strong, the fracture may not be symmetric. The professionals recommend taking periapical and occlusal radiographs after surgery to evaluate the fracture line. Also, the central incisors should be carefully examined, and the probing depths compared with the initial values. “The excessive buccal inclination of posterior teeth may lead to the occurrence of bone dehiscence, contributing to gingival recession”, they add. These results highlight the need of proper surgical technique with careful handling of gingival tissues.